Why is there not a video and/or paper instructions for dissembling and placing stroller in bag? I want to love this, but it is overwhelming. Please provide support. I've tried many times, googled, watched YouTube videos and I can't get the select to fit in this bag, even with only 1 seat. The stroller frame and the seats seem to be too long to fit the bag. I wish there was a video made by baby jogger with how to get it to fit. Seriously wondering how it could possibly fit. No instructions came with it, can't find anything online. A video would be very helpful. Bought this to keep the baby jogger city mini gt dust free when not in use. The stroller fits in the bag perfectly. The bag is very well made and has pockets to store the wheels in. I have googled and searched how to put the stroller in the bag. Why are there not instructions on how to put everything in the bag correctly? I have the stroller down to the bare structure and the wheels in the appropriate locations but I can't get the seats to fit. Why are there no instructions??? I ordered this for a trip to Jamaica and i leave in a matter of days and for the life of me, i can't get my stroller to fit in the bag!! Wheels and accessories are off. Why aren't their instructions included? Please contact me to help. Thank you. I purchased this bag to keep our stroller from getting damaged during our flight. We took two flights and unfortunately the bag already has multiple small tears on the bottom of the bag. There's no way this bag will keep our stroller damage free for our next trip. We tried several bags as we live overseas and airline travel is frequent in our lives. We do not travel with this stroller now because it is such a pain.By the time you pack everything into the bag it is SO heavy! Airlines are rough on strollers and drag the bags. I wish the bag was more durable like the stroller, had wheels and padding. why would you not include basic instructions of layout for how the double stroller fits in the bag??!! Bag supports folded stroller with pockets for wheels and accessories. Cheaper buying direct here than it was thru other vendors, happy with purchase so far. Unbelievable that a product like this come with no instructions. Anyone knows how to fit the wheels in the bag? We bought this just a few weeks back and took it on our travels to Orlando. It was perfect. We were so glad to have this case, as it kept our stroller clean and safe. We witnessed the crew throw other strollers on the ground. But our stroller was safe and sound. Recommend for anyone traveling via plane. Purchased this to use to take my City Select on a trip with us. Went to put it in the bag and it does not fit. I was not very happy and will be returning this item. Many reviews said their stroller with the second seat has held up with airline travel. Mine did not. One of the foot rest broke on both sides. I have had this stroller for one month, six days. I called baby jogger and they said the warranty does not cover the seat if it broke while flying!!!! if using for other than airline travel, it's a nice bag. This bag is nice and padded and will be so helpful when traveling on an airplane with out city mini gt. It's nice and padded and even have some big deep pockets in the inside to put wheels or other stroller accessories in while traveling. I wish all the stroller companies made bags like this put their strollers in. This product is exactly as advertised. We have a double stroller (front and back) that is quite large. I was skeptical, but the carry bag accommdated the stroller, both seats and two food/drink trays! It survived multiple flights and proved quite convenient. Great purchase. Albee prices can't be beat! This bag is great for my city mini GT. I've yet to use it for my international flight but based in my research and the reviews this is exactly what I need. The stroller fits great and the bag is high quality. Time and time again I make my bigger gear purchases from Albee when possible because they have by far the best prices and offer discounts on top of affordable prices. I feel like they are a hidden gem. Super fast shipping every time. Well made bag. Easy check in bag for airlines travel. Airlines had no problem checking our stroller. ProsEven though the bag has special compartments for the wheels I had plenty of space to keep the front wheels on, so when we arrived I only needed to pop on the rear wheels and stroller was ready to go. ConsWheels or bag pack straps might make it easier to carry with other bags. Best UsesWe bought it for traveling on plane. I used this one 1 trip. The wheels have to be removed to work, which is ok because the come off easily, but the spoke poked a hole thru the bag. so the material didn't hold up. it also would be beneficial to have wheels. with that said, it would still buy again due to the fact that i wanted to check the stroller and it protected it better than if i didn't have it. Consmaterial not sturdy enough for the spokes of the wheels that must come off to fit in bag. no wheels for easy transport in airports. Where are the instructions on how to place the wheel? The previous carry bag that I bought had specific instructions in order to store the stroller properly. Recently used the bag in transporting stroller on the airplane. ConsIt would be nice if it had wheels. I actually use this more to store all of my stroller accessories when not in use. Works great!. we have stored our city mini gt in it a few times when travelling. great bag for the money! Used this to go on vacation with my city select. Kept the stroller safe through 4 flights round trip. I was able to gate check which made my life easier. Overall a nice bag for the price. 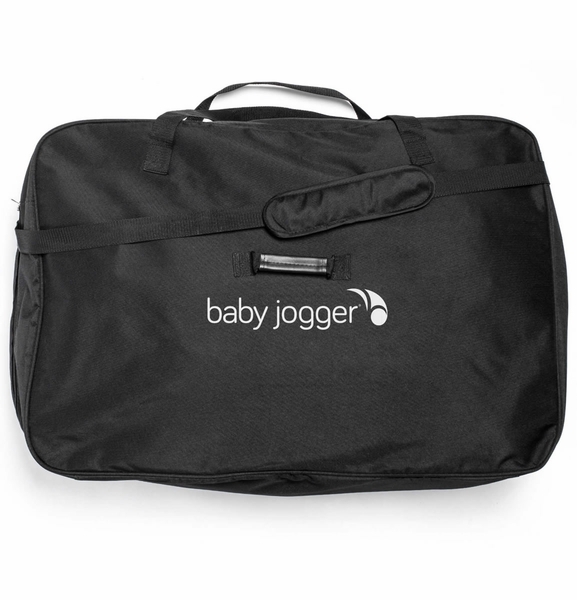 The Baby Jogger® Carry Bag helps parents store and keep track all of the stroller parts. It has specialized storage compartments for the stroller wheels, is made of durable fabric and a sturdy carrying strap. Fits Single City Mini™, City Mini GT, City Elite, and Summit single model strollers.